The apartment is conveniently located just 10 minutes from the airport, one block from the most prestigious areas in Cartagena. You will discover dozens of restaurants, hotels, nightclubs, casinos and shopping within walking distance from the apartment. This is the only apartment building with a private entrance to the beach. During the day you can relax at the pool, with a fantastic view of the beach/ocean. 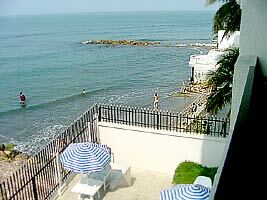 This spacious apartment is ideal for two traveling to Cartagena. Kitchen is completely furnished with all the utensils and equipment necessary for any culinary adventure! Enjoy Comfortable bar seating opening to the living area. From the living room you can relax while watching international Cable TV, or just enjoy the wonderful relaxing view. From the balcony sit or lie down and relax in the hammock. Listing to the tranquil ocean waves as they hit the shore down below. 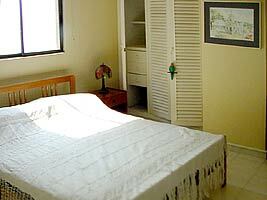 Bedrooms are fully furnished with AC, Queen size beds, and window views to the ocean. 24-hour security with doorman. Enjoy complete privacy, with the comfort of 24-hour security. Location: Just one block from the Cartagena. 2 bedrooms, 2 baths, living room, full kitchen, pool. 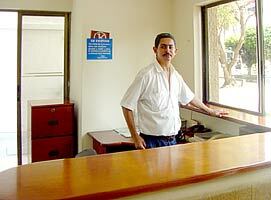 Building fully secure with 24-hour security/doorman. Balcony overlooks pool and ocean-great views, beautiful sunsets. 5 minute walk to A Foreign Affair office. Very clean, like new, many amenities. 1 minute walk to restaurant, night club and casino.